Television, movies, pop music, video games, the Internet, radio—the media of mass communications—are the chief mechanisms that determine “public opinion.” Entertainment programming is as important as slanted news coverage in the process. Most of us are passive consumers of media throughout our lives. Entertainment programming simply “appears before” us. In reality, of course, unseen people manage a massive physical and creative machinery generating the sights and sounds that stream unceasingly into billions of mesmerized brains globally, molding perceptions of reality and changing opinions and values. Thus, a vast infrastructure surrounds the finished product. It is important to understand the race, ethnicity, religion, and ideological agenda of those who create it, and the business, legal, and government institutions necessary to sustain it. 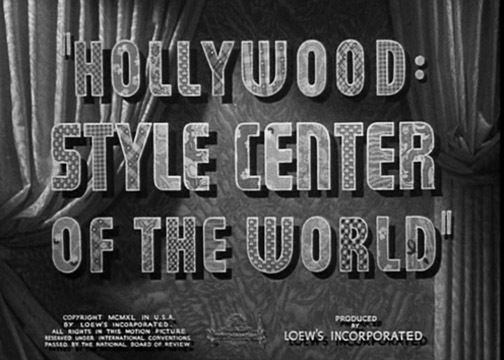 For a century Hollywood has created, disseminated, and influenced entertainment programming around the world. 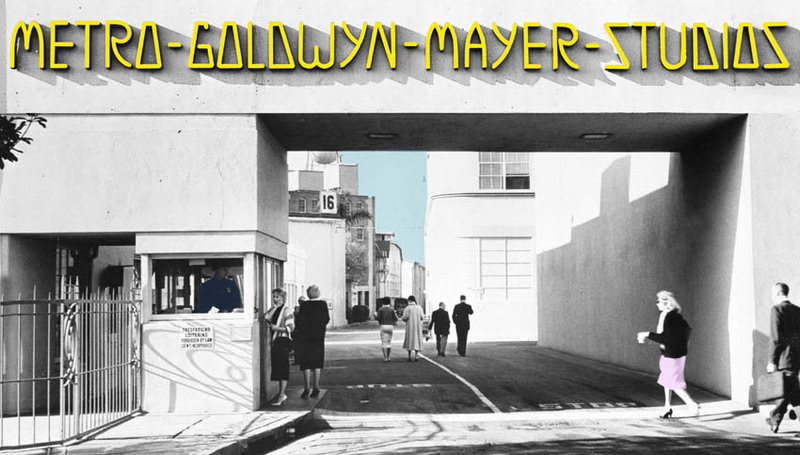 During Hollywood’s “golden age” from 1925–1952, Metro-Goldwyn-Mayer (MGM) was the premier movie studio in the world. Although the environment in which MGM and other historic studios flourished is gone, the company usefully illustrates the productive process—the Wizard behind the curtain. MGM was formed in 1924 by Marcus Loew, a New York Jew who controlled an extensive chain of movie and vaudeville theaters, when he purchased and merged three California studios: Metro Pictures, Goldwyn Pictures, and Louis B. Mayer Pictures. The cost was $65 million ($875.3 million, or just short of $1 billion, today). 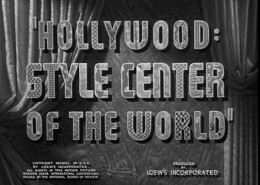 Although Louis B. Mayer (Lazar Meir, a Russian-born Jew) was placed in charge of production at the Culver City, California studio, the firm was owned and controlled throughout the period by Loew’s, Inc. of New York City. Mayer was a vice president of Loew’s, but not a shareholder. The studio released 50 movies a year under a rigorous shooting schedule and exacting budget. Two 10-minute MGM shorts from 1939–40, part of the studio’s Romance of Celluloid series, as well as a look at the studio itself, provide insight into the physical and logistical infrastructure behind the motion picture business at that time. The narrator of From the Ends of the Earth enumerated some dazzling facts for theatergoers. From “sunny France” rare perfumes arrived at the studio—”authentic bottles of the most luxurious scents”—for use on the beauty salon set of The Women. In MGM’s wardrobe department, thousands of yards of imported cloth and laces were transformed by the scissors of expert cutters into the style creations of costume designer Adrian and his large corps of assistants. Greta Garbo’s Ninotchka (1939) utilized hundreds of imported art objects from all over Europe. From Africa and India elephants, baby elephants, lions, tigers, and chimpanzees were imported. A 70-year-old automatic, piston-powered fan from Lahore, in the Punjab country of central India, driven by compressed air heated by a kerosene lamp, was used as a background prop in a scene from Lady of the Tropics (1939). 9 million board feet of lumber from the forests of North America, enough to build a city of 1,500 homes. A quarter-million gallons of paint. 110,000 pounds of rope, ranging from 1/4-inch sash cord to 6-inch hawser. A company switchboard with 2,400 extensions handled thousands of calls per day. Enough electricity, supplied by MGM’s own electrical plant, was used each year to light 25,000 homes. An onsite film laboratory processed 4.5 million feet of film per week, consuming 300,000 gallons of water per day drawn from the studio’s three artesian wells. Despite a certain unevenness, including brief segments without sound, a 10-minute YouTube clip showing some of the screen tests for Gone With the Wind (1939) is instructive about acting, including the fierce competitiveness of the profession. The man occasionally heard off-camera is Jewish homosexual George Cukor, originally assigned to direct the film. He was later replaced by Victor Fleming. Thirty-two actresses tested for the part of Scarlett O’Hara, which eventually went to Vivien Leigh, including Tallulah Bankhead, Susan Hayward, Lana Turner, Joan Bennett, and Jean Arthur. A city within a city, MGM’s vast movie wonderland was closed to the public. It was carefully concealed from view on 6 fenced and gated lots totaling 185 acres. Administrative headquarters was located in the Irving G. Thalberg Building on Lot 1, a white Art Deco structure graced with an early air-conditioning system. It had 235 offices for studio executives, producers, directors, writers, and legal and story departments. As many as 7,000 books, plays, and stories were read annually, and half a million story synopses kept on file. The 44 acres of Lot 1 contained many of the studio’s 135 permanent buildings, including support offices, a commissary, barbershop, 28 sound stages, laboratories, photography studio, sound facilities, technical buildings, and specialized departments for cameras, lighting, special effects, miniatures, publicity, and fan mail. The Projection Department had 22 screening rooms. The industrial center contained everything necessary for motion picture production: upholstery, carpenters’, machine, blacksmith, florists’, plaster, and plastic shops, a metal foundry, and a lumber mill. Railroad spur lines delivered trainloads of lumber and other supplies on a regular basis. The busy Research Department fact-checked scripts, costumes, and set designs. MGM’s music department archived 4 million selections, making it the third largest music library in the world after the Library of Congress and the New York Public Library. The Casting Office handled as many as 12,000 calls a day. The Makeup Department processed up to 1,200 actors an hour or 12,000 a day. Stored in the Property Department were more than 1 million props from every nation and historical period, including guns, clocks, full-size locomotives, row boats, and horse-drawn buggies. The Art Department was responsible for creating the detailed, lavish exterior sets on the studio’s backlot, as well as “exterior” and interior sets for the many huge, soundproof, indoor sound stages. An estimated 20 percent of all movies made in the United States were shot somewhere on the MGM backlot. The permanent standing sets of locales from the four corners of the earth were used over and over, year after year, film after film. They were continuously altered, redressed, repainted and shot from multiple angles. Many widely-seen movies and television shows were shot on sets that viewers never knew were located on a studio backlot. Facades were seen over and over again by the same audiences hundreds of times, yet uncritically perceived as Paris one week or Transylvania the next due to cleverly devised visual cues, painted backdrops, street signs, or establishing shots that deceived people again and again. The 37-acre Lot 2 was situated across Overland Avenue from Lot 1. There was the Animation Department, where Tom and Jerry and other cartoons were drawn. William Hanna and Joseph Barbera got their start there. Lot 2 also boasted the most-used section of the backlot, almost 10 acres re-creating six full-scale city blocks of New York and its boroughs, down to street signs, manhole covers, and fire escapes—detailed mock-ups of Park Avenue, Fifth Avenue, and streets known as East Side-West Side Street, Hester Street, Gullem Street, Church Street, Warehouse Alley, and Brownstone Street. Lot 3, on 65 acres, also held many elaborate sets, including the Tarzan series’ “Jungle Island,” a 65-million gallon man-made lake, a tropical rainforest, rock formations, winding roads, a circus set, military bases, a POW camp, farms, and ranches. Satellite Lots 4, 5, and 6 surrounded Lot 3. These contained the studio zoo mentioned previously with animal cages, a pen, and performance rings, thoroughbred horse stables, storage sheds for all modes of transportation, including fleets of aircraft and locomotives, and a nursery where plants, trees, shrubs, flowers, and even sod were grown for interior and exterior sets and the studio’s own landscaping needs. I’ve always been haunted by and interested in Hollywood’s backlots in general. The idea that there exist places in the world where there are entire phantom towns constructed to mimic the real world—and yet where no one has ever lived, could ever live, is fascinating and mysterious and a little creepy. Backlots are supposed to duplicate our lives, our homes, and the city streets we move through every day, and yet although they can be as familiar to us as places we’ve lived in our actual lives, they remain unknowable, untouchable, just out of normalcy and of recognition. Descriptions of MGM’s many contemporary and period sets in Culver City, long since leveled to make way for residential subdivisions, remind one strongly of a working version of Disneyland. Could Walt Disney have gotten his innovative idea for theme parks from MGM and other Hollywood studios? Disney’s parks resemble studio backlots far more than they do earlier amusement parks such as Coney Island. 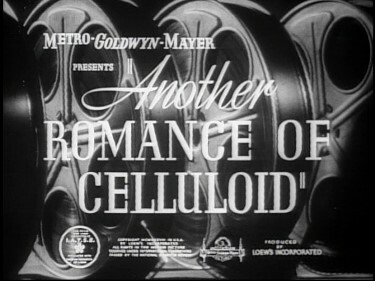 Another 10-minute MGM short, Hollywood: Style Center of the World: Another Romance of Celluloid (1940) provides some insight into the influence motion pictures exert over psychology and behavior. The short opens with a miniature movie-within-a-movie: scenes of threshers harvesting wheat, pictures of fields, cattle, a barn, and a little Midwestern farmhouse where the story begins. There a teenage farm girl receives a telephone call from her boyfriend inviting her to go on a date. She reminds her father that he promised to buy her a new dress, so they go to town to get one. And so, in this little town, far from the metropolitan influences, the Hollywood style reaches out to style and gown Mary just as smartly as Joan Crawford. Her ensemble was immediately responsible for Mary’s dress selection in the Susan mold. But why? Simply because the motion picture has annihilated space, blotted out the backwoods, and banished what was once our custom to call “the country.” Today the girl from the country is just as modern, and dresses just as smartly, as her big city sister. Fashion scouts from the garment industry comb movie magazines for tips on ever-changing cinema fashions. Next, commercial designers re-create the latest Hollywood modes, and dress factories mass produce the new designs. It is pointed out that MGM costume designer Adrian (Adrian Adolph Greenberg, a bisexual Jew married for 20 years to white actress Janet Gaynor), “Hollywood’s foremost studio designer,” had done more to influence style trends the world over than any other designer. The Wardrobe Department on Lot 1, with 15 warehouses and 150,000 costumes from every historical period, outfitted as many as 5,000 actors and extras per day. Creating this New England utopia was all part of L. B. Mayer’s master plan to reinvent America. In most of his movies that came under his control, Mr. Mayer knew that he was “confecting, not reflecting” America. He wanted values to be instilled in the country and knew how influential films could be. The picture helped Mr. Mayer cast a spell on America, on its values and attitudes and images. This astute observation from an unlikely source is applicable to all Jewish media moguls past and present. How successful they have been, and how unfortunate we have been, as a result. Published: February 26, 2013 | This entry was posted in North American New Right and tagged Andrew Hamilton, articles, Hollywood, Metro Goldwyn Mayer, MGM, movie reviews, North American New Right, originals, the Jewish question. Both comments and trackbacks are currently closed. Yes, become a mirror of America, both outwardly and in terms of our self image. White Americans get used to seeing themselves in the mirror of television and movies. And then they began to change the image – and Americans, wanting to fit in, became the reflection not the reality. Did MGM employ … only … 4000 people, at its peak? I always assumed there were far more. Is that all movie mythology? Or is it coming from Detroit, where factories employed 10s of 1000s? Didn’t they have 100s of writers, for example, chained in bungalows, or was that only in Barton Fink and Sunset Boulevard? And one cop per 40 employees sees like overkill; what were they afraid of? I guess that show how much power media technology can give someone. It’s scary how fast the jews from the former Russian Empire took over America by the early 20th century. This is so good, I hesitate to comment for fear I will offend Americans. I am very good at that. I find the descriptions of the capacities of the Dream Factories fascinanting. Oldtime Hollywood was a splendid Pagan revival in the midst of the 20th century. Some of the most beautiful and enduring American movies were made at MGM between the 1920s and 1940s. For my part I don’t get the point of most of Hamilton’s pieces, as well as the significance of the constant sexual and ethnic outings. I also don’t think a guy like Louis B. Mayer can be compared to today’s Jewish media moguls. Give him back to me anytime. MGM films appealed strongly to White tastes, values and sensibilities. It was not the Jews of Hollywood who were behind creation of movies that“appealed strongly to White tastes, values and sensibilities”. It was White people who forced this, first by boycotts and other means and then by making Hollywood come up with the Production Codes which prevented the Jews from showing degenerate or pornographic movies. However as always the Jews did not stop and lead the effort to undermine the Codes and created modern Hollywood. Richard Nikolaus Eijiro von Coudenhove-Kalergi (German: Richard Nikolaus Eijiro Graf Coudenhove-Kalergi; Japanese: リヒャルト・ニコラウス・栄次郎・クーデンホーフ=カレルギー Rihiyăruto-Nikorausu 栄次郎 (= Eijiro) Kūdenhōfu-Karerugī; November 16, 1894 – July 27, 1972) was an Austrian politician, geopolitician, philosopher and count of Coudenhove-Kalergi, who was a pioneer of European integration. He was the founder and President for 49 years of the Paneuropean Union. His parents were Heinrich von Coudenhove-Kalergi, an Austro-Hungarian diplomat, and Mitsuko Aoyama, the daughter of an antiques-dealer and oil tycoon in Tokyo. It is insanely naive to think that Hollywood doesn’t affect the malleable brains of both the young and even the older among us. Here’s a point that is true, without the slightest doubt. Millions of people, lost their lives to cancer, because Hollywood movies made smoking look cool. Period!! Nieztche and William Pierce said that the Jews are the World biggest haters… They hate more than we hate them.